Susan’s engagement ring got a major overhaul. Heather’s diamond earrings turned up on her engagement ring. Terri Berry’s earrings and necklace became new earrings and a ring. In the summer of 2010, I started thinking about redesigning some of the jewelry MrB gave me before I started my own jewelry line. I finally got to work on it this spring, spurred on by the rising price of gold. It made sense to melt down and sell old metal. Also, because of out-of-control raw-material costs, I needed to cut back on the number of new designs I was creating for my line. That problem with doing that is that store buyers and magazine editors only want to see what’s new. 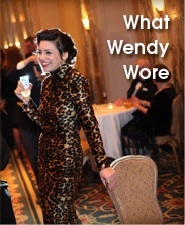 To give those people something to see, I decided to turn unworn jewels into fresh Wendy Brandes looks. 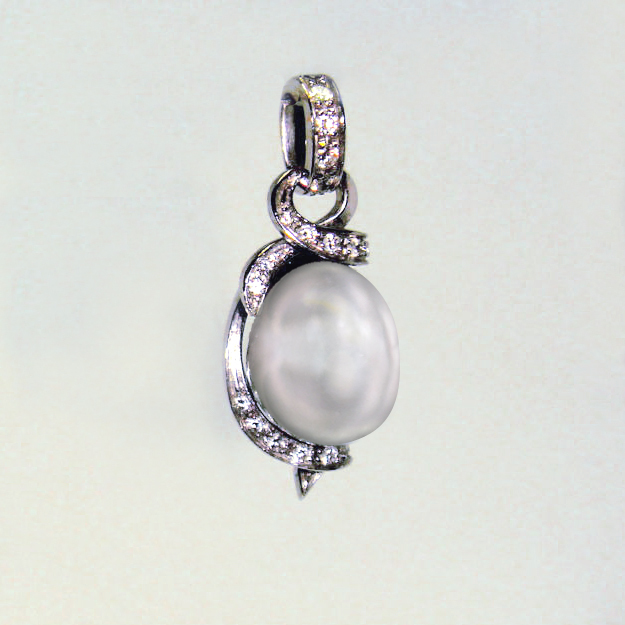 The first piece on my list was a chubby, irregularly-shaped, silvery pearl pendant that MrB bought in Italy in 1998. I always loved the color and shape of this pearl. 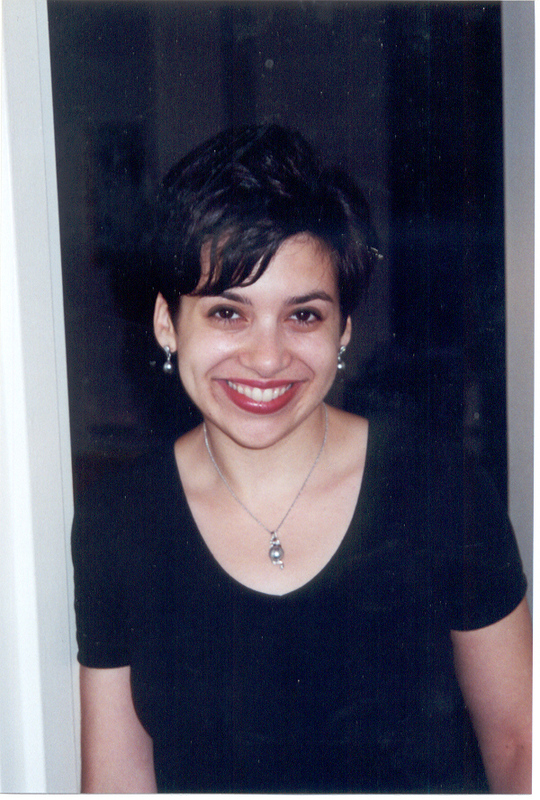 Here I am wearing it in 1999 with a pair of complementary earrings. Wearing the original necklace in 1999. I hate that picture, not just for the terrible hair day I was having, but also because I’m wearing a goddamn black t-shirt! How many decades have I been wearing those? Anyway, here is a closeup of the pendant in its white-gold and diamond setting, right before I dismantled it. The setting was very pretty and showed the pearl nicely, and I dithered for a while before taking it all apart. I went ahead because, as I’ve written before, it doesn’t do me any good as a jewelry designer to wear designs that aren’t my own. And this was much more conservative than my current taste. Because it’s common to surround pearls with white or black diamonds, I decided to do something more colorful. I thought purple would look fabulous with the silver pearl, but amethysts aren’t cut in the tiny size I’d need for the setting and I couldn’t find purple sapphires in the shade I wanted. I wound up choosing one of my favorite gems, tsavorite, which is a green garnet that I’ve used for my Marie Antoinette and onyx skull rings. Marie Antoinette ring. Click for more information. 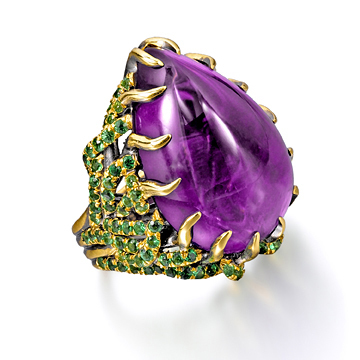 Once I picked tsavorite, it made sense to do a twisting, vine-like setting to match the rings. Because the setting would obscure the irregular shape of the pearl, I left some open spaces so I could peek inside and see the outline of the pearl. 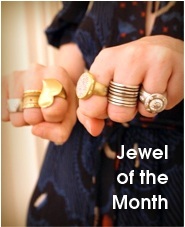 Here is the final result — and November’s Jewel of the Month. WendyB's redesigned pearl pendant. Photo by SquareMoose. Click to see on my website. People often ask me if it’s okay to mix white and yellow metals in one outfit. With this design, as with a number of my other designs, I mixed metals within a single piece. 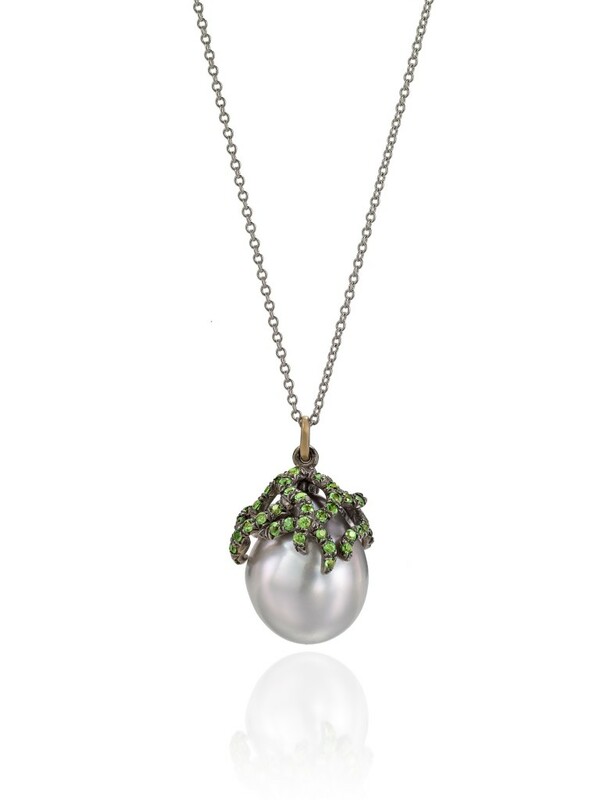 The tsavorite is set in blackened 18K yellow gold to give the green more warmth, while the chain is 18K white gold to match the pearl. The best of both worlds! Because I used my own pearl in this necklace, it’s not for sale, but I’ll happily make you something similar. Holla at me at wbjewelry at hotmail dot com if you’d like to place a custom order. Claws are totally metal, even if that metal is worth $1600/ounce these days. When did you start wearing black shirts every day, and what prompted that sartorial decision? Oooh I really like the green vine effect too! It looks perfectly complimentary to the other rings! Amazing job! LOVE the pendant redesign….you have the eye lady!! That’s a beautiful piece. How YOU! It looks a bit . . . sinister. Very nice — it looks like an edgy Schlumberger (in a good way)– ! Your 90s picture is cute! That’s not my idea of a bad hair day. The pearl necklace is stunning. I would love one :). LOVE it. Such a great redesign! My anti-spam was ‘brandes’ – spot on. So I just spent 20 minutes re-reading your blog because I clicked on a link, then another link and yet another link. Your engagement ring is beautiful. And so is Siobhan. She keeps drawing me back. One day! Really pretty — I like the green with it. And LOL about the black shirt! I’m right there with you. Ooooh, a new piece! I totally love it!!! And WendyB in 1999 — toooo cute! Thanks to everyone for your comments! I figured this design wouldn’t be to everyone’s taste, so it’s nice to know some peeps like it! I LOVE it. The moss is so delightful. 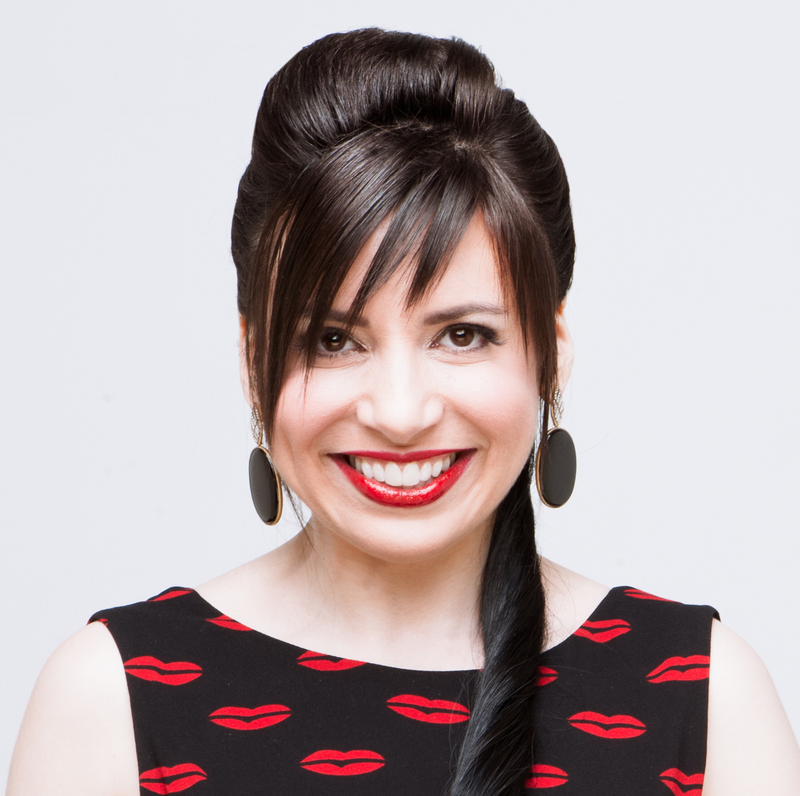 I love that you are able to update your jewels like this – it makes so much sense to take that necklace that is no longer your style and transform it into something new. It’s still the same jewel from your man, and now you are actually wearing it again. Far better than tucked away in that drawer. I don’t think I’ve ever seen a pearl piece of jewelry that I could say I loved… until now. That’s so beautiful and unique. Pearls are usually terribly ladylike, but this is organic, edgy, and dare I say, magical? I love your redesigns, they’re always so incredibly inspired by the materials you use. I feel like I learn a lot about jewelry from you. often with many compliments. I love pearls. A fave is still the ‘Marie Antoinette’ ring!! Oh, and ‘Disco Whistle’. Those two rings are my absolute favourites of everything in your entire collection. *sigh* I continue to buy lottery tickets (actually, I don’t buy them, my husband does, but I plan to keep him if he wins). Love what you did with the pearl. I love mixed metals. My husband is in charge of lottery tickets too. 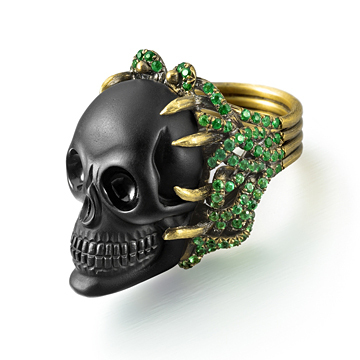 This ring is both elegant and slightly sinister. And earthy. I’ve never seen pearls with tsavorites so close together and i think the tones set each other off beautifully.